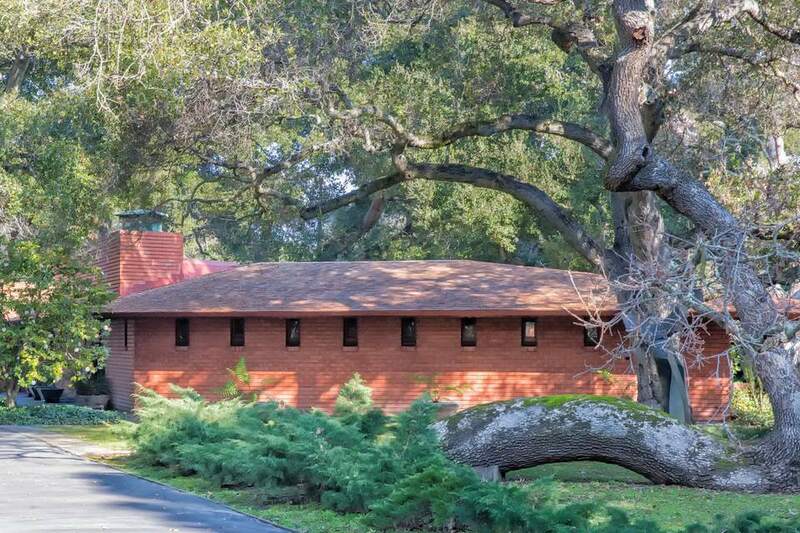 Even the most ardent Frank Lloyd Wright fan could be excused for passing right by the Arthur Mathews House in Atherton, California without noticing it. You could say that's a tribute to Wright's use of organic architecture principles. The red brick and wood-clad Usonian-style design blends in with — and nearly disappears behind — the ancient oak trees surrounding it. Very little is known about the house's original owner — or its current one for that matter. Public records show that it last sold in 1969 for $75,000. In 2017, it was estimated to be worth more than $5 million. The Mathews House is located in the town of Atherton on the San Franciso Bay peninsula between San Francisco and San Jose. The small and exclusive area is among the most expensive zip codes in the US. Current and former celebrity residents include football player Jerry Rice and baseball player Willie Mays, Lindsey Buckingham of Fleetwood Mac, and high-tech CEOs Eric Schmidt of Google, Charles Schwas, and Meg Whitman former CEO of Hewlett-Packard and eBay. It was designed in 1950, a year in which Wright designed almost 20 homes that included the Robert Berger House in San Anselmo and the Wilbur Pearce House in Bradbury. It is one of only two Wright houses in San Mateo County, with the other one being the Sidney Bazett House in Hillsborough. During his career, Wright designed approximately 60 middle-income family homes in the style he called "Usonian." They were typically small, single-story houses with no garage and often created in an angled "L" shape to fit around a garden terrace. The house is laid out based on a diamond shape. It has two separate and parallel wings that connect to a central dining area and workspace. It has three bedrooms and two bathrooms in 1,920 square feet of living space on slightly less than an acre of land. Wright designed both built-in and freestanding furniture for the house. The Philippine mahogany built-ins were constructed, but the other furniture was not. The house is a private residence on a dead end street. No public tours are given. You can drive by and see a view similar to the one above, but little else. You can see some historical photographs and blueprints for the house at SaveWright.org. The Mathews House is one of eight Wright designs in the San Francisco area, including two of his most important works. Use the guide to Frank Lloyd Wright in the San Francisco area to find all of them. Wright's Usonian houses were designed for middle-income families, they featured indoor-outdoor connections and were often built in an "L" shape: Hanna House (which is based on an octagon), Sydney Bazett House, Buehler House, Randall Fawcett House, Sturges House, and the ​Kundert Medical Clinic in San Luis Obispo (which is based on a Usonian House design). Also in Atherton are two homes on the National Register of Historic Places: the Holbrook-Palmer Estate also called Elmwood and the Watkins-Cartan House.